Introduction, or: what is meant with 'ground loop'? Actually this text is written for german visitors. Some references to the german power and cable system are made. Perhaps it is not transferable into your situation. If one connects a stereo amplifier with the computer using an audio cable sometimes a bothering, humming noise is coming out of the loudspeakers. This is caused by a so called 'ground loop' (Actually this is a translation of the german word 'Erdschleife'. another common word for this is humming loop 'Brummschleife').). There are several possible reasons for such a loop. Often the "misfortune" starts after the PC is connected to the hifi equipment or a new subwoofer gets connected to the stereo amplifier. This article likes to explain the causes and offers a small, cheap circuit that solves the problem easily. Actually the causes and reasons how a ground loop is generated are quite complex. Sometimes it also depends on the cabeling in your household and how the electrical devices are connected together. Devices grounding over the electric power supply system are often the source for "trouble". Additionally all devices with antenna connectors also are often causing trouble because the coaxial outer conductor is connected to antenna ground. In most cases devices like satellite receivers, tuners and VCRs are connecting to antenna ground with the antenna cable. What is the electrical background of a ground loop? In the "classical" case this big loop is behaving like a "transformer with one coil". This "transformer" receives the magnetic leakage field of the electrical power supply system. If you are living near long-, medium or short wave transmitters sometimes radio stations are also 'picked up'. Often this causes very annoying interferences. This inducted tension is overlaid with the wanted audio signal on the audio connection between computer and stereo amplifier (The outer conductor of the audio connection is part of the big loop in the above example). This causes the audible humming noise. As a transformer needs a low-resistance conducting loop an interruption of the loop is sufficient to end the humming. Please see on the right side for a small filter for your antenna connection. I removed this part in the 'international' (english) part of this document. It is specific for germany (Electrical cabeling, security measurements, labeling of cables, power plugs etc.). The audio connection cable can be separated galvanically - but this is a little bit problematic. Interruption of the antenna cable is described here. Never ever disconnect grounding cords in the house main equipotential bonding. Protective ground (In germany the green-yellow wire) of devices must not be cut. The reason for this is obvious: protective ground is a method to protect the user (i.e. YOU) against dangerous touch voltage of the housing and devices connected with wires to this device. If you interrupt protective ground this functionality is disabled and dangerous electric potential could develop on the housing. The audio connection is not suited well for an interruption. You have to insert a small isolating transformer that disturbs the audio quality. Additionally an useable isolating transformer for audio signals is quite expensive. How to interrupt the ground loop in the antenna cable can be found on the right side of this page. As described in the left paragraph the best place to interrupt the ground loop is the antenna connection. As the wanted signal is a high frequency signal it is quite easy to insert a small circuit that avoids the galvanic coupling and disables the low frequency humming noise. Additionally the antenna input	has a low impedance over a wide frequency range. 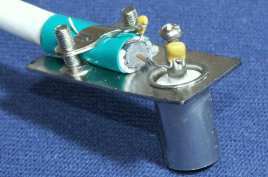 In contrary to purchaseable filters I just build two 100 nF ceramic capacitors into a coaxial right-angle plug as shown in the image below. With the capacitive interruption the hum caused by the ground loop is disabled. As you can see the coaxial right-angle plug was converted to an antenna cable filter with a few parts and in a few steps. The coaxial ground conductor (outer conductor) is protected with isolating tape to avoid contacting the metallic parts of the plug. The ground cord is connected by one of the 100 nF capacitors to the metallic housing plate of the plug. 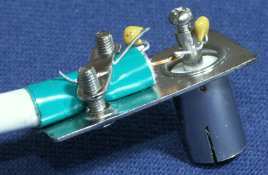 The inner conductor is connected via the other 100 nF capacitor to the screwable collet for the inner conductor. Another view of the circuit to show the arrangement of the two capacitors. The next image shows the circuit of the filter in principle. A reader of my webpage told be that the photos of the plug are not clear. You can easily imagine that this little trick causes a mismatch of the antenna cable to the device. For the wanted signal (frequency between 45 and 800 MHz) the mismatch is very small. Assuming a common impedance of 75 Ω and the usage of 100 nF capacitors the reactance Xc will be always smaller than 0.07 Ω for frequencies over 45 MHz. In theory that means an insertion loss of less then 1 dB. The reflectance factor is very small. If you are building this circuit you should take care to take capacitors with useable HF behavoir. Additionally the parts with non-coaxial wires should be as short/small as possible.